Along with Planquette’s Les Cloches de Corneville, La Fille de Madame Angot (Théâtre des Fantaisies-Parisiennes, Brussels, 4 December 1872) was the most successful product of the French-language musical stage in the postwar decades of the 19th century. Even such pieces as HMS Pinafore and Die Fledermaus, vastly successful though they were in their original languages, did not have the enormous international careers of Lecocq’s opéra-comique, which swept the theatre world from one side to every other with unmitigated triumph for many, many years before settling into a permanent and prominent place at the head of the all-time French musical theatre repertoire. 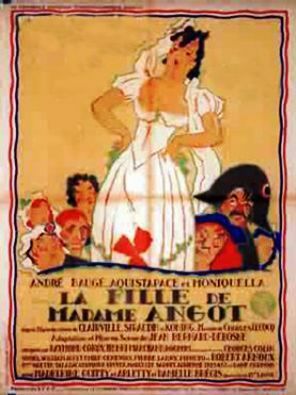 Sheet music cover for ” La Fille de Madame Angot”. In fact, La Fille de Madame Angot had its first showing not in France, but in Brussels, under the management of the producer, Eugène Humbert, who had mounted Lecocq and Clairville’s previous work, Les Cent Vierges. The story goes (one of them, anyway) that the success of Les Cent Vierges led wheeler-dealing Victor Koning to thinking that another original work might do equally as well in Brussels. He proposed the idea to the playwright Paul Siraudin, who came up with the thought that there might be a libretto in the series of Madame Angot plays, written by the dramatist Maillot, which had found such success at the turn of the 19th century. Playwright Clairville was called in to put Koning’s notion and Siraudin’s idea (which may, or may not, have included dipping into Dumas’s 1853 historical novel, Ange Pitou, for a hero) into libretto form, Lecocq to set the resultant piece to music, and Humbert was only too pleased to take in a new piece by the writers who had given him his earlier hit. Koning and Siraudin — neither of whom had written a word of the text — both kept their names on the bill as co-authors and, naturally, in the share-out of the royalties. Another version of the birth of La Fille de Madame Angot gives the ideas all to Humbert who is supposed to have seen Clairville, Siraudin and Koning’s Revue en ville, approached them to do an opéra-bouffe Roméo et Juliette for the Alcazar and, when they found that that didn’t work, proposed instead a piece with a Directoire setting. If the piece were light in character he intended to give it to Lecocq to set, if heavier then to Litolff. But it was still Clairville who wrote it (with all the lyrics moulded, vaudeville fashion, to exisiting tunes), Siraudin who put up ideas, and Koning who did the business. Clairette (Pauline Luigini) is the orphaned daughter of the famous fishwife Madame Angot, whose gallivanting with the Grand Turk has gone down in legend. She has been brought up, with all the advantages their money can buy, by the market-folk of Les Halles and her multiple `parents’ are happy that she should wed the adoring, gentle little wig-maker Pomponnet (Alfred Jolly). But Clairette has other thoughts. She has been enraptured by the dashing political poet Ange Pitou (Mario Widmer), and so, rather than be wed to Pomponnet, she gets herself arrested, on what should have been her wedding day, for singing one of Pitou’s dangerous songs in public. She is freed by the influence of a former schoolmate, the actress Mademoiselle Lange (Marie Desclauzas), who has risen to power as the mistress of Barras, a member of the ruling Directoire. Lange, however, is secretly part of a conspiracy to overthrow the feeble and corrupt new oligarchic government of the country. Trouble arrives with a vengeance when Lange and Pitou meet and strike instant sparks. Clairette is not slow to recognize the signs, and she sets a trap for the pair, luring each to a rendezvous at the Bal du Calypso with a forged letter. When the actress and the poet openly express their feelings amongst the hedgerows of the Calypso, Clairette is waiting, with her ever-protective `family’ at her back. But Mademoiselle Angot does not need protecting: it quickly becomes clear that she is no little cowering beastie, but the hard-tongued, strong-backed daughter of her famous mother. The two women go for each other, and when it is all over Clairette hands the faithless Pitou over to her friend and rival. She will wed the good and true Pomponnet, but given the strain of her mother that is so evident in her, one cannot fear that she will never see Ange Pitou again. Chambéry played the financier Larivaudière, Mlle Lange’s second string lover, Ernotte was the snooping policeman, Louchard, Mme Delorme played Amaranthe, the most vocal of the heroine’s deputy mothers, and Touzé played the stand-out cameo rôle of the conspiring `incroyable’ Trénitz, effete and foolish in his dress and speech, but a veritable icy hero under danger. The score of the show was a non-stop run of winning numbers, beginning in the first act with Clairette’s sweetly grateful romance `Je vous dois tout’, Amaranthe’s lusty description of the late Madame Angot (Légende de la mère Angot: `Marchande de marée’), Pitou’s lilting admission that although `Certainement, j’aimais Clairette’ other attentions do not leave him indifferent, and the plotworthy anti-governmental song (`Jadis les rois, race proscrite’). Lange’s cleverly delayed appearance, at the top of the second act, was made all the more effective by her dazzling and difficult first number, `Les Soldats d’Augereau sont des hommes’, in which she counts on the masculine weakness of the Directoire’s forces in her organization of a grand ball as a cover for a conspirators’ meeting. From there, Pomponnet’s featherweight `Elle est tellement innocente’, the happy duo of the old schoolfriends (`Jours fortunés de notre enfance’) and the first meeting of Lange and Pitou (`Voyons, Monsieur, raisonnons politique’) led up to the highlight and climax of the act, the whispered Conspirators’ Chorus – soon to be world-famous – and the whirling waltz (`Tournez, Tournez’) in which Lange leads her conspirator-guests into their cover-up dance as the government troops approach. Unlike many contemporary third acts, that of “La Fille de Madame Angot” did not fritter away into a brisk pairing-off of its participants, and the musical part of the last portion of piece was equally as strong as its text. Larivaudière and Pomponnet, in the dark alleyways at the Calypso, joined in the Duo des deux forts, and Pitou and Lange shared a Letter duet (`Cher ennemi que je devrais haïr’), on the way to the other famous moment of the night’s music and drama, the blazing Quarreling Duet (`C’est donc toi, Madam’ Barras’) in which Clairette and Lange face up to each other at the show’s dénouement, bringing the final act, like the preceding one, to a particularly effective musical and dramatic peak. La Fille de Madame Angot was a huge hit in Brussels. Les Cent Vierges was put quite in the shade by the new piece and Marie Desclauzas, in the rôle of Lange, made a veritable triumph. Koning soon had a Paris transfer underway, and Louis Cantin mounted the show at the Folies-Dramatiques less than three months after its Belgian première whilst the original production continued on towards its 400th and 500th nights in Brussels. Paola Marié was cast as Clairette for Paris, alongside former daredevil circus-rider Mendasti (Pitou), Luco (Larivaudière), Mme Toudouze (Amaranthe), Philippe Dupin (Pomponnet) and Legrain (Louchard) and, at Lecocq’s insistence, Marie Desclauzas was brought from Brussels to recreate her rôle of Lange. In spite of some undercasting (Luce had been cast for Pitou, but died while the show was in preparation), some sloppy staging and a fire in some paper draperies on opening night, the Brussels triumph was repeated in Paris and La Fille de Madame Angot became a sensation, with the Quarreling Duet and the Conspirators’ Chorus immediately proving themselves the hit songs of the time. The show ran through 411 performances, until April 1874, on its first run, setting a Parisian record as the first show in stage history to have run an entire year without a break, and topping a profit of an unheard of 800,000 francs. 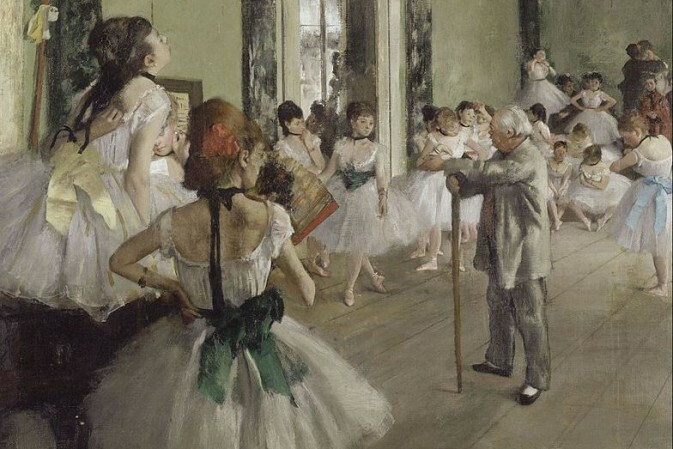 It was brought back following the summer recess in the same September, and remained in the repertoire at the Folies-Dramatiques continuously through the years that followed, passing its 800th performance on 17 May 1883. Juliette Simon was amongst those who took over the rôle of Clairette (the first year had used seven of them), Simon-Max took his turn as Pomponnet, and Vois (Ange Pitou) and Mlle Daltona (Lange) were among the other pensionnaires of the Folies-Dramatiques to take a turn at the now famous rôles. Parisian revivals thereafter were legion. An 1888 Eden Théâtre production put Anna Judic and Jeanne Granier together as the two rivals (10 February), in 1889, at the Variétés, Garnier teamed with Marcelle Lender, and a revival at the Gaîté paired Juliette Simon-Girard’s Clairette with the Lange of Yvonne Kerlord for 200 nights (1901). Germaine Gallois and Edmée Favart played another 106 performances (1912) at the same house before the Opéra-Comique’s Marguerite Carré and first Raymonde Delaunois (1920) and then Jenny Syril (1921) gave their versions of the star rôles. In 1918 the piece was produced at the Opéra-Comique, first for a single performance with Mlle Favart and Marthe Chenal, and then as a full-scale repertoire piece (19 June 1919) with Mlle Favart paired with Mme Merentié and Edmond Tirmont as Pitou. It was brought back there in 1953 with Maria Murano and Colette Riedinger, and again in 1969 with Michele Herbé and Christiane Darbell, and it made its most recent Parisian appearance in 1984 at the Théâtre Musical de Paris. Although Cantin reaped the rewards of the Paris season, Humbert did not let go of his hit. In May he took the original cast, with Jeanne d’Albert replacing the departed Desclauzas, to London, and these first French performances (`a success of the most unqualified character … exactly what opéra-bouffe should be’) were followed some four months later by the first English-language version. Henry Byron’s adaptation, produced at the Philharmonic Theatre, added the Alcazar Dancers in a `Nuit de Carnival’ as a speciality in the third act, and popped in a song by musical director George Richardson (`Can This Be Love?’) who had also reorchestrated Lecocq’s score. With Julia Mathews (Lange) and Selina Dolaro (Clairette) starred, the show ran no less than 235 performances at its suburban house, as other theatres moved quickly to produce their own versions. The copyright laws of the time allowed protection only to the Philharmonic’s English version and not to the French original: anyone could mount a Fille de Madame Angot on the British stage with impunity, and they did. The Gaiety was the first West End house to enter the ranks, six weeks after Islington’s première, taking in Emily Soldene’s company with an H B Farnie version, which fattened up the rôle of Lange for Soldene by having her appear in disguise as a street-singer in the first act. Soldene was again Lange to Pattie Laverne’s Clairette at the Opera Comique before the year was done (26 December) for three and a half months and a quick reprise. That one was no sooner done that the Globe Theatre took up a five-week season of another Angot (ad H F Du Terreaux) with Cornelie d’Anka as Lange, so that London had two versions of the show running concurrently for seven months. Productions of the show flooded Britain’s provincial theatres, and they also continued to bombard London: the Philharmonic, Gaiety, Criterion (Humbert’s troupe), Opera Comique, Royalty (ad Frank Desprez in a dramatically reshaped star-vehicle version for Dolaro), Alexandra and the Holborn Amphitheatre all played the show in 1875. The Opera Comique took it in again in 1876 and in 1878 d’Anka and Dolaro starred in a production at the Alhambra which introduced a sabot divertissement, the French grotesques Les Quatre Bossus, the Gardes Françaises in a grand military ballet, a children’s `Dresden China minuet’ and `illuminated cascades of real water’ into the final act. The Theatre Royal, Drury Lane, took in productions in 1880 and again in 1919 (ad Dion Clayton Calthrop, G Marsden), the Criterion Theatre staged another in 1893 and the Coronet hosted a revival in 1901 (11 February) before the show’s West End life was done. Like London, New York saw its first Angot in French, with Marie Aimée starring as Clairette opposite Rosina Stani in 1873 and opposite Leontyne Minelly in 1874, and it spent most of its life — rather less outstanding here than in France and England, partly because of the system — being played by repertoire companies rather than in a continuous run. Alice Oates’s company introduced the first English performances soon after, Soldene sang Lange as part of her New York season of 1874-5, Lydia Thompson helped herself to the score for the musical part of her burlesque Mephisto (1874), Paola Marié repeated her Paris performance to the Lange of Mme Angèle in 1879, Louise Théo played the piece in her repertoire, and it was part and parcel of the touring baggage of every touring opéra-bouffe and -comique company of the era. The Casino Theater mounted a production in 1890 with Marie Halton as Clairette and Camille D’Arville as Lange, with Henry Hallam (Ange Pitou) and Fred Solomon (Larivaudière) and ‘a new Ballet des Fariniers written especially for this production by M Lecocq’, which was the nearest the show got to having a straight Broadway run. Yet another English-language Fille de Madame Angot was seen when the piece was given its first Australian performances. This one was the work of Fred Lyster, brother to producer W S Lyster, and known for taking large liberties with operatic scripts. Clara Thompson (Clairette), Jennie Winston (Lange), Armes Beaumont (Pitou) and Henry Bracy (Pomponnet) were starred in this production, the first of many, usually in the London adaptations, which followed in the repertoires of virtually every opéra-bouffe company which appeared in Sydney and Melbourne over the years that followed. Amongst these were included the much-travelled Soldene, with Rose Stella as her Clairette, and Emilie Melville who cast herself in the other of the two lead rôles, and who took the show on to India and the South Pacific. Luscombe Searelle exported the piece to South Africa, where it was played with his wife, Blanche Fenton, as Clairette. “La Fille de Madame Angot” has been seen as recently as 1989 in America, played by the Ohio Light Opera as Clairette (ad James Stuart), but Britain’s revived D’Oyly Carte Opera Company jibbed at a remounting when its publicity director objected of the internationally most famous musical play of the 19th century ‘no-one has ever heard of it’. Ernst Dohm’s German version was produced at Berlin’s Friedrich-Wilhelmstädtisches Theater, and achieved ‘one of the longest runs know [for] some time…’ topping a hundred, then 150 nights and going on for more, whilst a different German adaptation by Anton Langer was mounted by Franz Jauner at the Vienna Carltheater a few weeks later. The Friedrich-Wilhelmstädtisches Theater in Berlin. Hermine Meyerhoff (Clairette) and Antonie Link (Lange) starred alongside Wilhelm Knaack (Larivaudière), Franz Eppich (Ange Pitou), Kustner (Pomponnet), Karl Blasel (Trénitz) and Therese Schäfer (Amaranthe) and the show scored up 55 almost en suite performances. The 100th was passed on 13 August 1874, the 150th July 28th 1875, and the 181st and last under Jauner’s management on 19 May 1878 with Carl Streitmann playing Pomponnet. 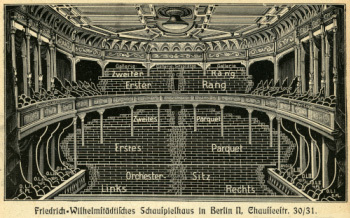 The show continued for a few performances more in repertoire under Franz Tewele’s management and later got a couple of short showings at the Theater an der Wien in 1886 (13 April) and in 1901 with Ottilie Fellwock (Lange), Turk Rohn/Frln Genscher (Clairette) and Blasel in his original rôle (10 performances), but it did not attract the later revivals its fine original run might have presaged. Hungary’s version (ad Pál Tarnay) also proved a hit when produced at the Népszinház with Lujza Blaha (as Soldosné) as Clairette, Karolin Daray as Lange, János Kápolnai as Ange Pitou and Elek Solymossy as Larivaudière, after its first performances had been seen at Kolozsvár with Ilka Medgyaszay and Zoltanné starred. A first run of 48 performances was followed by revivals in 1887 and 1897, a production at the Magyar Királyi Operaház (1887) and another at the Magyar Színház in 1900 with Ilona Szoyer featured as Clairette. 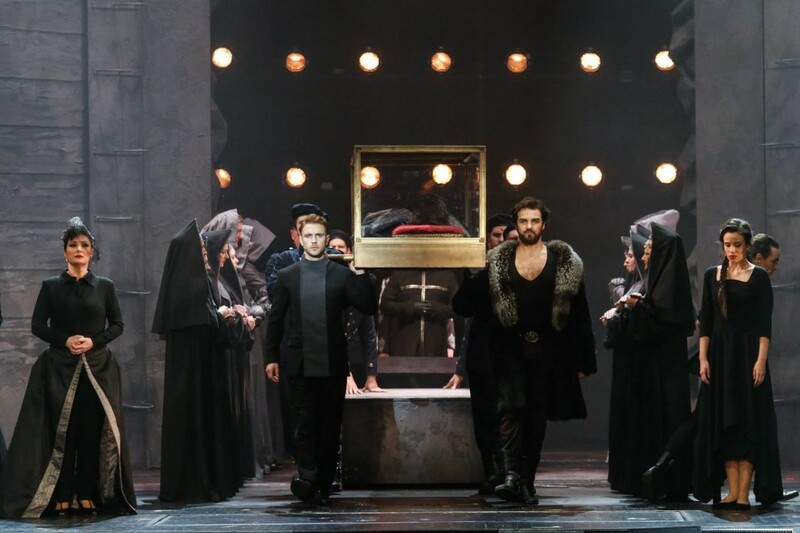 The piece was also adapted into Russian, Spanish, Italian, Swedish, Turkish, Polish, Danish and Czech and a Russian-language production from the Moscow Art Theatre was seen in both Berlin and in New York in 1925. The Portuguese, however, instead of just lifting the libretto, as was the usual habit of their Spanish neighbours, turned out a Le Fils de Madame Angot (Angelo Frodoni) at the Theatro del Prince Royal in Lisbon (5 May 1875). The show set loose a very flood of Angot parodies and spin-offs of all kinds on the Parisian stage. Armand Jallais authored a short vaudeville Madame Angot et ses demoiselles produced at the Folies-Marigny (19 June 1873) and Adolphe Joly provided another, Madame Angot ou la Poissarde parvenue, for the Ba-ta-clan (8 November 1873). 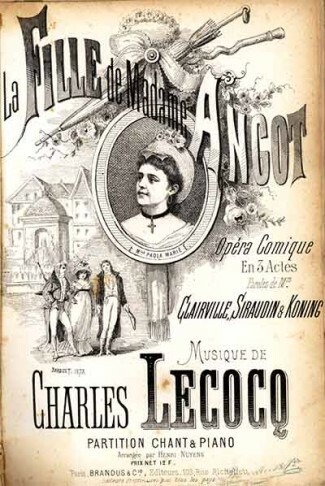 A one-act opérette Le Fils de Madame Angot by Dorfeuil using Lecocq’s music, was produced at the Gaîté-Montparnasse (25 September 1873), and L’Héritage de Madame Angot by Jules de Rieux and Villemer, with a Chassaigne score, at the Eldorado (24 October 1873), whilst Blondeau and Monréal went deeper and displayed La Nuit de noces de la fille Angot on the same stage (29 November 1873). The Funambules mounted a pantomime La Mère Angot by Hippolyte Demanet, the Alhambra christened its new-year revue Pas bégueule la Mère Angot (30 December 1873), and Clairville and Lecocq combined on a follow-up to their own piece with a saynète La Résurrection de la Mère Angot for the Folies-Dramatiques (24 February 1874). An Alfred Aubert vaudeville, L’Héritage de la fille de Madame Angot, was played at the Théâtre Serafin (25 March 1875), a pantomime Le Fils Angot appeared at the Scala (9 July 1876), a vaudeville Le Fils de Mme Angot at the Menus-Plaisirs in 1892 (26 November) and a L’arrière-petite-fille de Madame Angot by André Mauprey even turned up at the Théâtre des Folies-Dramatiques as late as 29 November 1912. Naples got a piece about Il padre di figlia di madama Angot (1881),and Vienna, too, had its Angot parody when F Zell and Karl Pleininger combined on an Angot und der blauen Donau for the Strampfertheater in 1874 (13 November). ‘It is an imitation rather than a parody’, sniffed a Viennese reviewer. So, undoubtedly, were a number of the others. The film version by Jean-Bernard Derosne. In the last half-century, productions of La Fille de Madame Angot have become fewer and, outside France, where it remains one of the staples of the classic repertoire, the show has not maintained the popularity which it won in the decades immediately following its production. With the movement of the operettic repertoire into the opera houses of the 1980s and 1990s, La Fille de Madame Angot, with its exceptionally strong dramatic, yet sophisticatedly comic, libretto and challenging star rôles, would have seemed a natural candidate for opera-house revivals, but the tendency up to date has been for such houses to stick to the frothier part of the repertoire and a handful of not always worthy shows by ‘posh musicians’ and `big names’. A version of the show was filmed by Jean-Bernard Derosne in 1935 with André Baugé as Ange Pitou alongside Danielle Brégis (Lange) and Moniquella (Clairette). Arletty was amongst the supporting cast..